Cris Worley Fine Arts is pleased to announce our fourth solo-exhibition with Adela Andea entitled Norðurljós, opening with an artist’s reception on Saturday, May 11th from 5:00 to 8:00pm. The artist will be in attendance from Houston, Texas. The exhibition will feature new standing and wall-mounted works in an immersive installation and will be on view through June 15th, 2019. 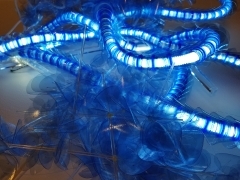 Andea is known for all-encompassing light installations designed with electrical components and found objects such as flex neon, LED’s, fluorescent cathode tubes, water-cooling systems, CPU fans, plexiglass, and an assortment of plastics. 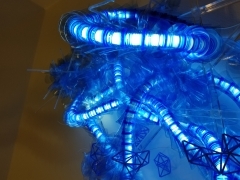 Appearing as glowing neural networks, individual sculptures display a wild assortment of color, sound, and texture that hold the potential to defy geologic time in their polymer skeletons. This exhibition will feature the artist’s recent explorations into FDM 3D printing, with parts produced uniquely for each artwork in the studio. A catalyst for the artist to create her diligently playful work is the growing dependence between humans and technology. Andea captures the aching reality of environmental pollution with her informally engineered works that seduce viewers into their attractive lights. The brilliant fluorescent quality of natural elements such as neon and xenon are as much a source of inspiration for the artist as the bioluminescent adaptations of intelligent life. Andea’s creations seem to visit gallery walls from the depths of the ocean or from celestial bodies in space. Adela Andea (b. 1976, Romania) currently lives and works in Houston, TX. Andea received Master of Fine Arts in New Media and a minor in Sculpture, from the University of North Texas in 2012. Andea was included in the 2013 Texas Biennale. She exhibits frequently throughout the country and has been featured in many art fairs such as Scope Miami, the Dallas Art Fair, Art Miami, Art Palm Beach, and the Houston Fine Art Fair, among others. In 2015, Andea participated in an artist-in-residence program with Zébra3 in Bordeaux, France where she created a public installation at 7 Vitrine Place du Parlement. Andea has been invited to create many public site-specific installations in Texas to be found in the College of Human Sciences at Texas Tech University, Lubbock, TX; Women and their Work, Austin, TX; Galveston Art Center, Galveston, TX; Gensler in Houston; the Fashion Industry Gallery in Dallas; and The Grace Museum in Abilene, Texas, among others. The artist was invited by designer Steve Madden to design an installation for a pop-up exhibition in the fall of 2018 in New York City.